Top tube curved which way? Humpbacked like an old Schwinn, or saddle-backed and droopy for standover? Which 20" wheel (I was about to assume 406, but you never know)? Is there a way to make the cargo bed Caltrain friendly? Could it be made foldable or something to make it less wide when needed? Anon: Humpbacked for a cruiser-ish look. BMX 20" wheel for decent fat tire options. BartF: Conceptually, where there is a will there's a way, but we would need to go back to the drawing board. That's really nice. Another bike I want, but at least this one is practical. 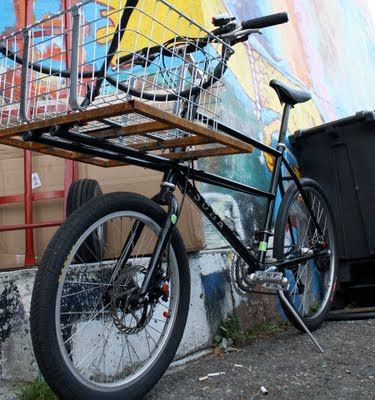 Looks great, I once owned an old cycle-truck and found it very useful. My 5'3" girlfriend and 6'1" self shared it. Keeping it light and lean enough to fit into doorways etc. makes sense. I would spec. the seat-tube to fit the largest diameter seat-post available so it would be strong when extended to fit somebody tall. It would also be nice to have the option to use a rim brake on the back if one chooses. They are cheaper and easier to maintain. Any idea what size the frame will be? Strange, that looks EXACTLY like the Ahearne Cycle Truck. @Anon: Strange, that Ahearne looks a lot like a Schwinn Cycle Truck. Hey, hey let's not fight. We admit the general design layout is much like the awesome Ahearne Cycle Truck (just one of the reasons why we are curving the top tube on the Tradesman), but we came up with the geometry for the Trademan on our own. Angles, TT length, tubing spec, even where the beam connects to the frame is probably not the same as on the Ahearne. I learned about this via EcoVelo. The "Pickup Artist" model they mentioned seemed even more interesting to me. I would like to see this bike come as a complete bike. (Personally, I'd like to see it built with affordable parts and fenders). As for now, I'm waiting for someone to start releasing cargo bikes at Bikes-Direct type prices. As was mentioned before, I think it's a NECESSITY that this bike be fender-friendly, rear rack frendly, (an integrated rear rack would be perfect), and be capable of being built with cantilevers instead of discs for us budget-minded people. It also needs a double-legged kickstand. Overall, I'm excited about this! I vote for curved top tube (humpback) as well. Looks classic and more styled. If this is supposed to be a practical bike then I would strongly suggest not having a 'humpback' top-tube. It only reduces standover/step-over clearance and will likely look aesthetically awkward as well as increasing cost. If you're going to go to the trouble to curve a tube, why not have it curve down from the headtube and run level/parallel by about the 1/4 to 1/3 mark back to the seat tube? I definitely vote for canti braze-ons - they'll be effective enough for this load size that they should be an option. Or maybe a canti version later? 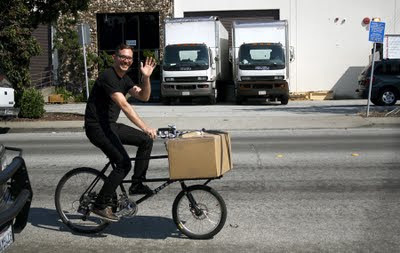 I'll keep my fingers crossed for a good quality, production box-bike/long-john/bakfiets as well! Slightly dumb I'm afraid to sell the frame as 'disk only'. Also the upward curving TT makes no sense - awkward for shorter folks. Love it. Saving $ now. Please make more than 20! TCB needs one of these!